Lately I have been having the type of luck that you don't even want to talk about because you are afraid of jinxing yourself. To be safe, I knock on wood as I share this. All these finds are from about 2 weeks ago...and I have plenty more from this week that still need photographed. I have been a bad, bad blogger getting so far behind. To begin with...I introduce the Pyrex. The Golden Scroll Cinderella from the chip and dip set was found at Salvation Army. 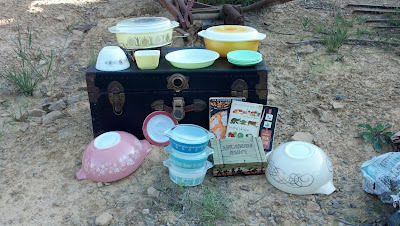 My Dad was absolutely fantastic and picked up the 2 Amish Blue Butterprint casseroles, the snowflake blue casserole, the pink gooseberry 444, the small town and country bowl, and promotional casserole in cradle at the flea market while I was at work. You see how this works right? I go make money while he simultaneously spends the money doing the shopping I wish I could...but at least I get to live through his adventures. The yellow fridgie and flamingo plate were from Goodwill while the lime pie plate and Daisy casserole were my flea market finds. Also found at the flea market were the 4 jadeite saucers and 3 small cookbooks. The trunk was an awesome yard sale score. Oh how I have longed for a trunk and for $5 I finally have one! Last, I found the Treasure Hunt board game from the 1940's at Goodwill. Thankfully it seems to have all the pieces and just generally seems pretty nifty. In addition to all these adventures, putting my time in with the daily grind, and spending some fantastic time with my boyfriend...I have also undertook a large project: Organizing my storage area. I think the best way to summarize this endeavor is that I discovered I have over a hundred of the small booklet style cook books(such as pictured above). Oh My. Happy Thrifting everyone and I hope to have updates on my new finds soon! Our thrifts RARELY have Pyrex! When I find a piece, I do a happy dance! You hit the JACKPOT! Thanks Danavee! :) Usually I can find a piece or two at the thrifts...my problem is that so many of them have faced the wrath of the dishwasher! Wow, that's quite the Pyrex haul! I always love how vintage Pyrex looks when it's displayed in bunches like that. Great finds! Thanks Heather! Pyrex really does have a strong impact when it is in a bunch! I just started to reorganized my room where I store all of my stuff I have for sale on etsy (or is waiting for me to photograph to put on etsy). It's kinda a big undertaking. I'm a few days in to the project. So far, it's not looking so good. I wish you the best of luck Melissa! I know it can certainly be overwhelming but I just keep focusing on the hopeful end result! Good luck with organizing your storage area! I struggle with keeping my sun room (my storage/work area) organized and tidy. I feel like all I do out there is put crap away instead of actual work, like listing or photographing. Your Dad is the Pyrex Master! Great finds. That trunk was a steal! Thanks Melissa! My dad is definitely awesome with finding Pyrex...and vintage goodies in general really :) I was quite excited about the trunk, I was a little shocked when the fella named that price! JACKPOT! I just acquired a few of these recently too. Always love how your dad is always on the lookout. Mine goes to flea markets, I tell him, but I don't think he really looks. He says he does, I don't believe it, lol. Thanks Sir Thrift-A-Lot! My dad definitely loves the hunt for Pyrex, I think he enjoys the thrill of finding something! If nothing else, I can certainly pinpoint where I got my collecting bug from :) Thanks for hosting the link up! Fantastic haul! Love how you chose to photograph also. Visiting from TTF and will sign to follow. Some awesome Pyrex! it always makes my day to find a great piece at a wonderful price. Thanks for sharing at TTF. Thanks Linda! I know exactly what you mean, it's amazing how a casserole (...or mixing bowl, etc) can brighten the day! That's a lot of great Pyrex!! Really nice! Oh my gosh, can't believe all that wonderful Pyrex your dad found! You must have an amazing collection. Thanks for sharing your treasures with Share Your Cup. Happy to be a new follower.